Did you know that Mount Bona and Mount Churchill in Alaska were the major contributors to the volcanic ash blanketing much of the park? Mount Bona is also the main source of ice for the Klutlan Glacier. Looking east across the Klutlan Glacier at Mount Constantine. YG Photo. The Kluane First Nation Final Agreement establishes the objectives for Asi Keyi as a Natural Environment Park. The objectives relate to the protection of natural values, First Nation values, economic opportunities within the park and public enjoyment of the park. to encourage public awareness, appreciation and enjoyment of the natural, historical and cultural resources of the Park in a manner that will ensure it is protected for the benefit of future generations. 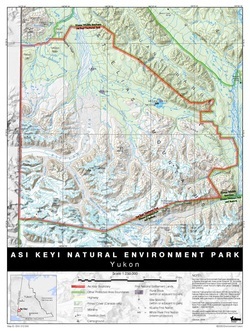 Asi Keyi Natural Environment Park is homeland of the Kluane First Nation and the White River First Nation peoples. Traditional use, family ties and cultural stories of two First Nations are inherent in the land and, today you can still find evidence of hunting and trapping sites, former camps and trails. Mary Jane Johnson and Elder Grace Margaret Johnson and Elder Bertha Doris visit the park during the June 2015 Elders visit. YG Photo. A research camp set-up in the alpine tundra. YG Photo. Access to the Asi Keyi Natural Environment Park is difficult. There are no roads or established trails so human use is limited. A few pack-trails crisscrossed the area and sign of their existence can be found today. This lack of accessibility lends itself to true exploration by backcountry travelers and those looking for an undisturbed wilderness experience. Asi Keyi Park is within the St. Elias Mountains Ecoregion. This ecoregion is characterized by vast regions of ice fields and high elevation mountain peaks. The volcanic geological history of the park leads to a rainbow of colors in the exposed rocks and sediments. YG Photo. A view of the across the park's dominant ecosystems from the alpine tundra across rock outcrops to permanent ice and snowfields. The valleys between these three peaks are filled with glaciers. YG Photo. The "drunken forest" on the toe of the Klutlan Glacier. The trees tilt as the glacial ice below them melts. YG Photo. See "Resources" tab for link to full size map. Map created by YG. Asi Keyi Park includes 2984 square kilometers of protected area. The park stretches from the Donjek River west to the Alaska border and from Kluane National Park north to the Kluane Range. The boundaries were established with the signing of the Kluane First Nation Final Agreement. Banner Photo: Glacial ice. YG Photo.